Gah, these guys were supposed to be one of the most exciting teams in baseball. You are looking at one of baseball’s biggest letdowns in the 2016, in the making. If you watch them on a nightly basis, they’re a terrible watch. No timely hitting (outside of Colby Rasmus), when they do get pitching they don’t get any hitting, when they do decide to hit a little bit their starter or bullpen gets hit a little more. There’s just no flow and a lynchpin seems to be missing. There are base-running blunders and mental errors and mindless at-bats by Carlos Gomez. You get those things until the cows come home with this bunch. 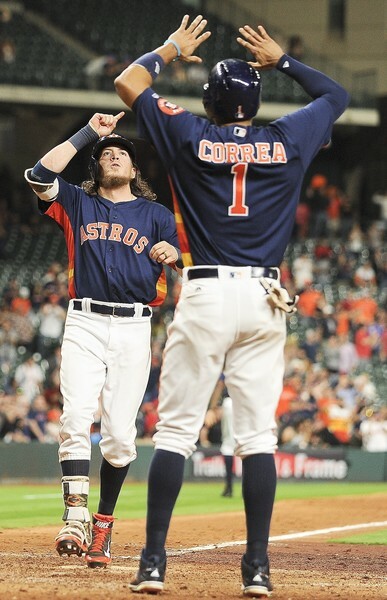 Last night, after Carlos Correa’s rocket double off Craig Kimbrel and Colby Rasmus’ dinger that was straight out of The Natural; I figured that this was a game they were destined to win. Instead, they played 12 long innings in front of their home crowd and lost their first showing on Sunday Night Baseball in over three years 7-5. It’s quite possible that the Astros find their way this season. I have no way to tell you how the next five months will go in a game that humbles me nightly. But about three weeks in; these guys look like they’re in deep trobule. And that’s a real shame. Just when we retired the F–k the Astros tag upon their move to the American League.